Are you thinking of offering food delivery services? Or you want to promote to more people? Get the word out with take-out menus. These prints are used as promotional materials because they're handy. You can hand them out like flyers or include copies in your delivery bags your deliveries. Here at UPrinting, we offer menus on standard or custom sizes. You can choose between vibrant gloss, elegant matte, and writable paper. We have folding and finish options for you to fully customize your prints. Order quantity is 50 – 100,000 pieces with turnaround time as fast as 1 business days. We also offer free services such as proofing and downloadable templates. 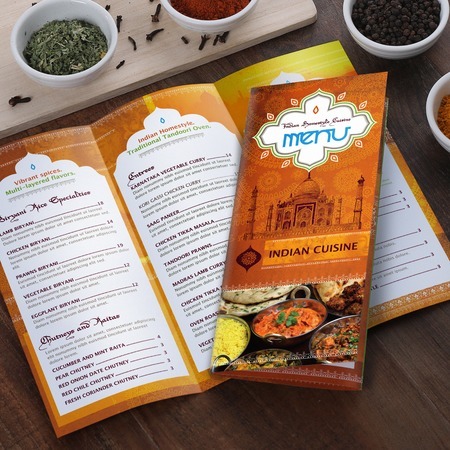 If you want to know more about take-out menu printing, call us at 1-888-888-4211. You may also click out “Live Chat” button on the upper right of this page. We are always happy to assist you on your printing needs! We can produce from 50 to 100,000 of your take-out menus at a standard turnaround time of 3 business days. However, if you require it, we also accept 2- and 1-day rush printing jobs. You can also have your menus folded to make them easier to carry around. Some of our options can even allow your diners to slip them into their back pockets! You can select from trifold, half fold, z-fold, roll fold, and accordion fold options. Check out our free takeout menu templates for file setup guides so you're more sure your menus will come out great!